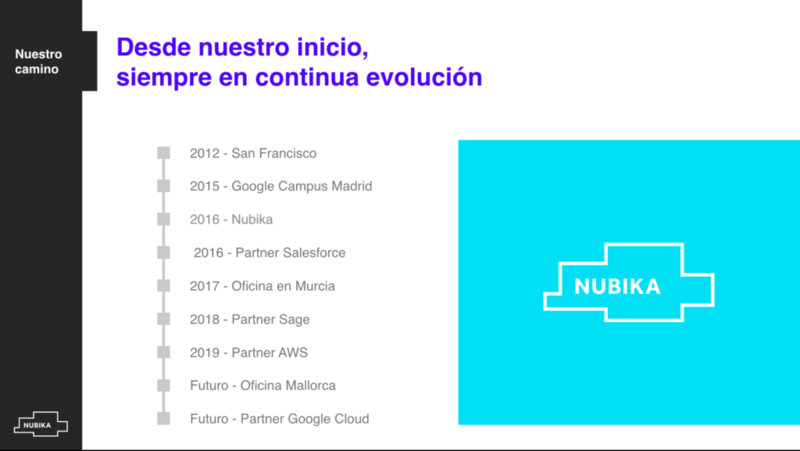 Nubika is a digital transformation consultancy firm specializing in cloud solutions. We bring the value proposition of a brand to its customers through technology. Our passion is the technology applied to companies. We believe that we can contribute a lot to the digital transformation of organizations and we do not settle for standard solutions. As there are no two companies that are the same, we cannot offer the same solutions. We are motivated to listen to the client and create. We meet as a team and innovate. We keep our promise of change and see it grow with our own eyes. ﻿Year 2012, San Francisco Bay. This adventure began in San Francisco, where its two founders had their first experience with Salesforce in the company Intrax. By then, Nubika was just an idea. They had received training in multiple Salesforce solutions and experience pushing them to stop along the way, think outside the box, put on their shoes and run outside the comfort zone. From the cradle of Salesforce to Google Campus, 2015. Upon returning from San Francisco they set up, even as a freelancers, one of the best campuses for entrepreneurs and their dream began to take shape with the third partner joining the company. Madrid, 2016. Nubika was the natural step to take once you feel comfortable with the long-awaited American way of life. Nubika would not be offices, schedules, obligations and eternal ´power points presentations´. Nubika would be people with experience forming a team, flexibility, professionalism, growth and respect. Yes, there would also be many hours in front of a computer tackling challenges, concerns and the odd hour without sleep solving riddles. But as a certain American businessman said “You do not choose your passions; the passions choose you. ” “Work”? What is that? And we also became a Salesforce partner! In October of 2017 our family grew. We opened a new office in Murcia and with it we gave way to a more solid company culture. Nubika is not just people. We are happy people. It might seem ambitious, but it is surprising to see how the new business buzz can feel on the other side of the world. We brought the best of the “tech” of The Bay: a professional and personal development plan so that our people feel looked after and motivated. We support each other when someone finds an obstacle in their way. The challenge for 2019. This year we are facing the challenge of creating an office in Mallorca where our development team will grow as well as reaching other partnerships. And we have already begun the journey. Although Salesforce is our main vehicle for transformation, we have recently become Amazon Web Services partners. We believe that it enriches us as professionals of the cloud who we are and who we want to become. We understand that learning never ends. Our personal motto is trust and respect. Trust to offer days of remote work when necessary, without justification and without imposing control measures: it is a right acquired from the first day with us. Respect and be aware of how important it is to grow professionally, not stagnate. And also respect your personal life, family and hobbies. We just want happy people! And when you’re not, we’ll support you as a team. The office is a place where we spend many hours a day and we want it to be as pleasant as possible and that is why we involve everyone who is part of the Nubika team. Far from the theory of chaos, this freedom becomes creativity: our raw material. Without clear minds, we cannot expect imagination, which is our leverage to innovation. We offer unique solutions for our companies. The projects we develop are from creative solutions with flexible methodologies. And through those, we can face the changes that may affect the business model of our customers. And what happens when balance is achieved within the team? We are also concerned about the balance that is needed in the outside world. Which is why we have joined Pledge 1% and since 2016 we have donated 1% of our annual profits and 1% of the time of Nubika employees to volunteer with foundations and non-profit organizations, dedicated to improve the lives of people around the world.